Back in the day, because of the navy connection, most tattoo shops in the United States were located on either the east or west coast. There were some cities in the middle of the country that were also a big draw for tattooists, but generally these cities were near military bases or large amusement parks. Fort Campbell is a United States Army base located on the state line of Kentucky and Tennessee. This massive Army base is positioned between the cities of Clarksville, TN (12.5 miles to the south) and Hopkinsville, KY (16.3 miles to the north). Fort Campbell was named after Union Army Brigadier General William Campbell and today the base is home to the famed 101st Airborne Division. 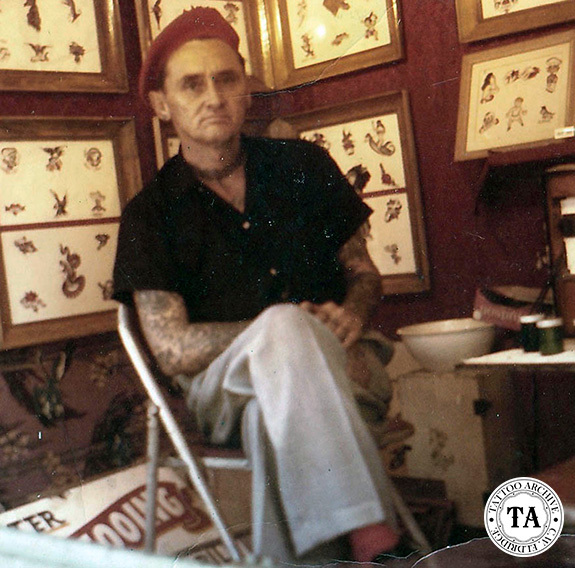 The base opened in 1942 and immediately became an area where tattooists could earn a living. 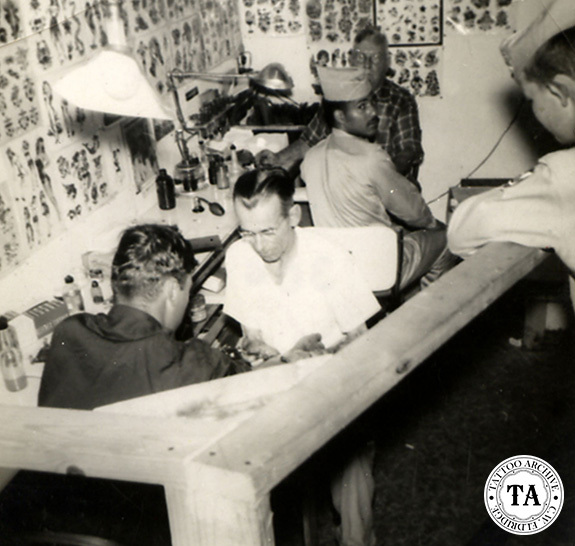 Following is a bit of information on some of the tattooists that worked around Fort Campbell and carried on the grand tradition of tattooing the fighting men and women of the military. 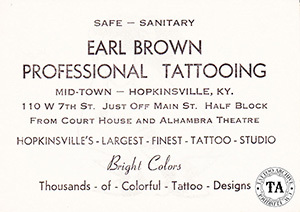 Brown, Earl Hubert – (1904-1983) Worked in St Louis, Biloxi, MS and Hopkinsville, KY This business card shows him at #110 West 7th St. just off Main Street. 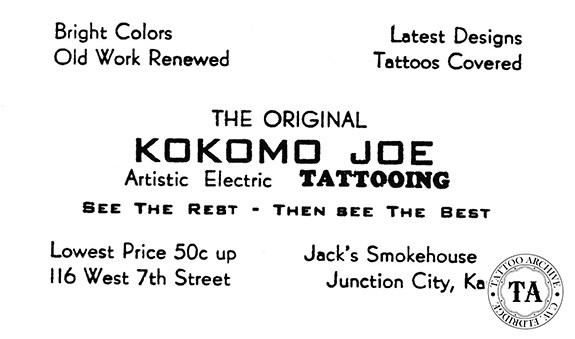 Queen, Joe – “The Original Kokomo Joe” learned to tattoo from Col. William Todd while in Clarkesville, TN. in the 1950s. This card seen here shows him at Jack’s Smokehouse in Junction City, KS. 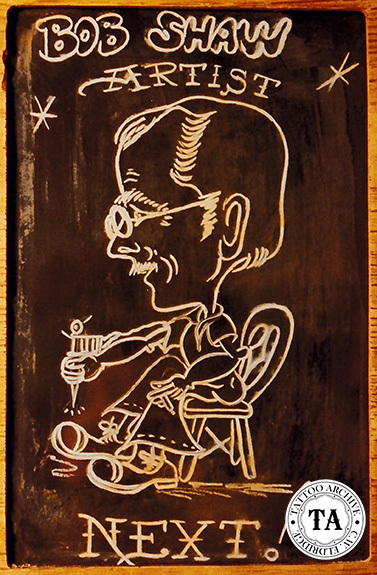 Shaw, Bob – (1926-1993) Yes, that’s the Bob Shaw! Bob Shaw at the tender age of 16 had a set of tattoo sleeves from Bert Grimm. Bob worked with Col. William Todd in both Clarksville and Hopkinsville in the late 1950s. 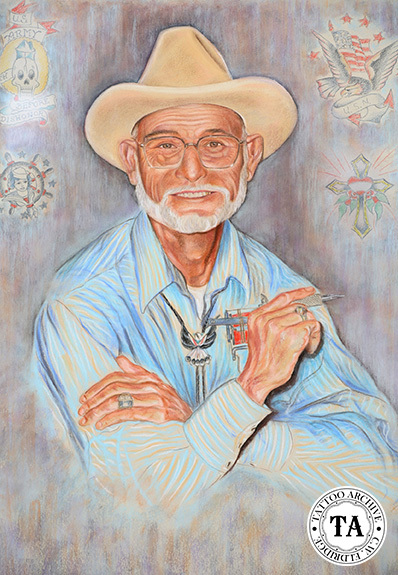 Todd, William – (1929-1994) Todd tattooed for at least five decades in cities like, Long Beach, CA, Escondido, CA, 29 Palms, CA, Fort Smith, AR, Evansville, IN, Denver, CO Clarkesville, TN and Hopkinsville, KY.
Wills, Jack – (1887-1976) The Wills card seen here show his move from #414 to #402 East 9th St. in Hopkinsville, KY. 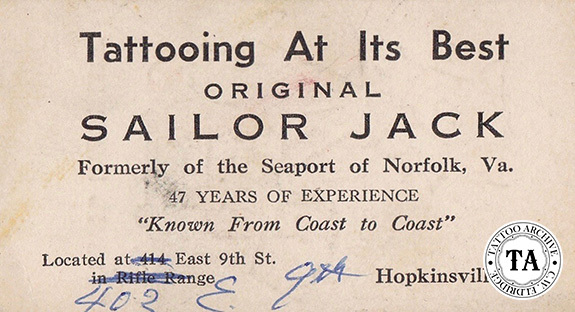 Note the “Formerly of the Seaport of Norfolk, Va.” Norfolk was so famous for it’s tattooing that even after tattooists left Norfolk they still wanted to be associated with the city. .